In two-syllable words, nouns, adjectives, and adverbs are usually stressed on the first syllable. Two-syllable verbs are usually stressed on the second syllable. Some words, called heteronyms, change part of speech when the stressed syllable moves. Some words, called heteronyms, have a single spelling, but two different pronunciations. 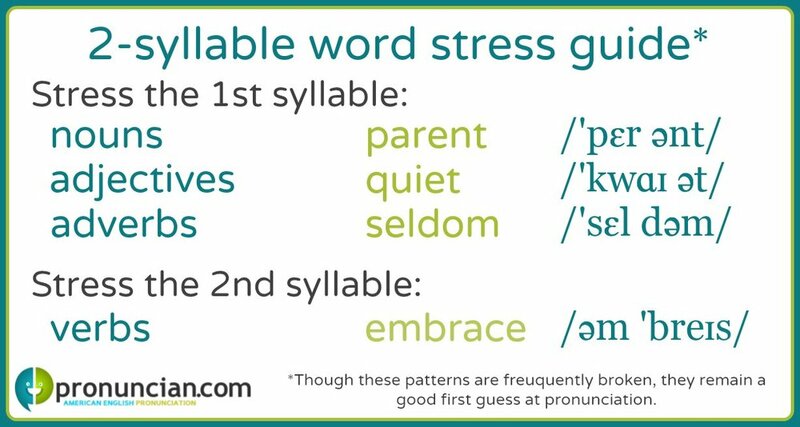 There are a number of 2-syllable words that are stressed on the first syllable when the word is being used as a noun or adjective, and stressed on the the second syllable when it is being used as a verb.